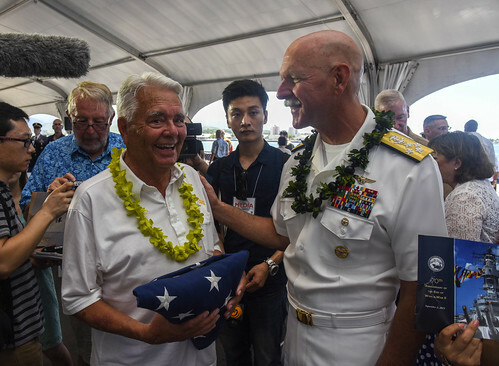 PEARL HARBOR - More than 400 service members, veterans, government employees, foreign leaders, and civilians attended the commemoration of the 70th anniversary of the end of World War II held aboard the Battleship Missouri Memorial on historic Ford Island, Sept. 2. The surrender took place on the wooden decks of the battleship USS Missouri (BB 63) also known as the “Mighty Mo” on Sept. 2, 1945. Fleet Adm. Chester Nimitz, Gen. Douglas MacArthur, Japanese Foreign Minister Mamoru Shigemitsu and other world leaders signed the Japanese Instrument of Surrender marking the end of the war. 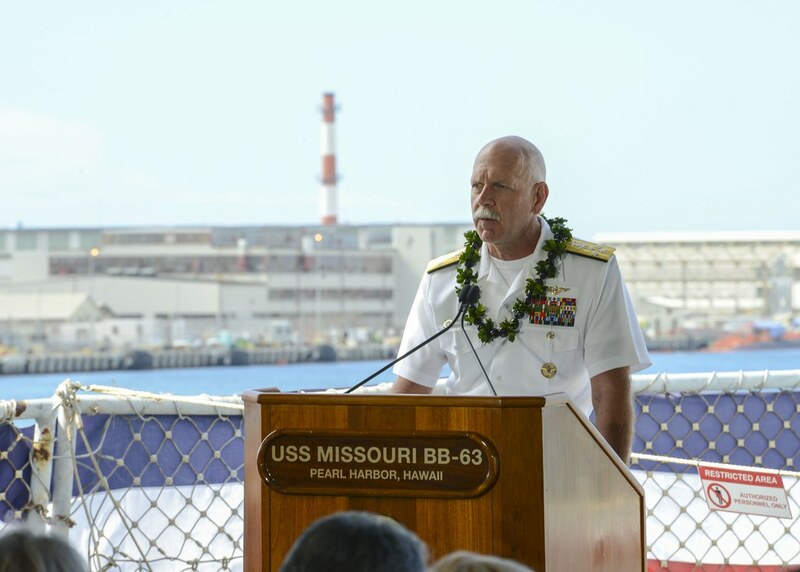 Adm. Scott H. Swift, commander of U.S. Pacific Fleet served as a distinguished guest speaker during today’s ceremony and offered remarks to those in attendance. Noting the transition from war to peace, Swift stressed the importance of commitment to U.S. allies, partners and friends and the importance of cooperation between all nations and strengthening these relationships. Swift also expressed his gratitude to the veterans for their sacrifices, their strength and for the future they secured for the new generations. During the keynote address, Senator Brian Schatz of Hawaii commended the collaboration between the United States and Japan in their efforts to rebuild the world around them and improve mutual understanding and respect after the war. “Despite the exhaustion from years of war America recognized it could not simply retreat from the world. So instead of turning our backs on the world, we turned our enemies into the allies that they are today,” Schatz said. More than 2,000 Sailors and Marines attended the original surrender ceremony, which lasted less than 30 minutes. Among them was Radioman Second Seaman Donald Fosburg. A former crew member of the Missouri, Fosburg celebrated his 89th birthday and was honored with the national ensign during the ceremony. He recalled what he felt returning to the ship more than seven decades later. 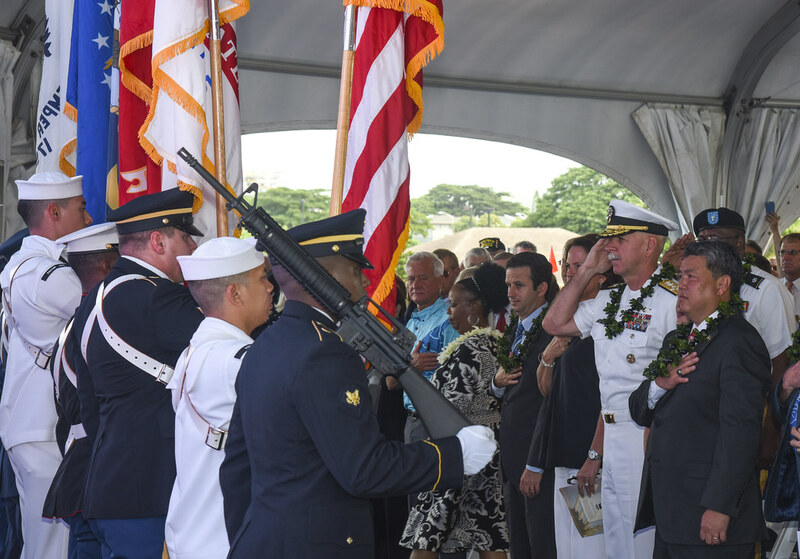 The ceremony concluded with a U.S. Navy ceremonial gun salute, Amazing Grace performed by Celtic Pipes and Drummers of Hawaii and echo taps played by the U.S. Pacific Fleet Band.